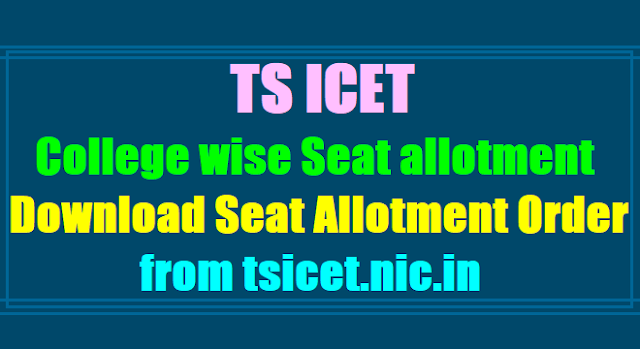 TS ICET 2019 College wise Seat allotment Results/Call letter to be released at tsicet.nic.in for MBA, MCA Admissions: TS ICET seat allotment 2019 result download at tsicet.nic.in: TS ICET 2019 College wise Seat allotment released at tsicet.nic.in and Download Allotment Order by Signing-In through 'Candidates Login'. TS ICET 2019 College Wise Allotment Results/Provisional Allotment List: The Telangana State Council of Higher Education (TS SCHE) will release the college-wise Seat allotment details for Integrated Common Entrance Test (ICET) 2019. Candidates who have appeared for and cleared the exam can check their results on the official website of the Council. The counselling had begun on July 06. KU conducted TS ICET 2019 on May .. for admissions into MBA, MCA Courses in professional colleges of the state. As many aspirants have appeared to take admissions under engineering and technology courses. The counselling for Telangana State Integrated Common Entrance Test (ICET) to fill seats of Master of Business Administration (MBA) and Master of Computer Applications (MCA) courses with eligible candidates has been commenced from July .., at SR&BGNR Government Degree College and at Kothagudem Polytechnic College. Aspirants who clear the allotment can gain admission to 11 courses including MBA, applied MBA (MAM), financial management (MBF), marketing (MBM), tourism management (MBT), hospital administration (MHA), human recourse management (MHR), media management (MMM), retail management (MRM), technology management (MTM) and master of computer applications (MCA). The TS ICET 2019 exam was held on May .. and its results were declared on June 06. Candidates had from July .. to exercise their options and the allotment results can now be found on the official website. 1) Allotments will be placed in Website https://tsicet.nic.in on ..-07-2019 by 08.00 PM. 3) Download the provisional allotment order and read the instructions printed and report accordingly. 4) And also download challan form for payment of fee. 5) Pay the fees if any, in any Branch of State Bank of Hyderabad. 6) Failure to report as per instructions given in the provisional allotment order by the date stipulated will automatically result in cancellation of seat and candidate will have no claim on the seat allotted.